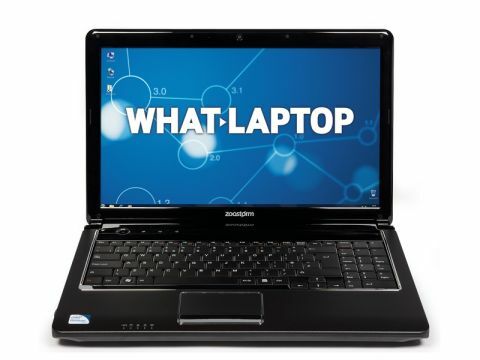 PC Nextday delivers cost-effective laptops via its Zoostorm range. The Zoostorm 3389-9426/A is a solid machine with some strong features, although it struggles to compete against some other laptops at this price point. The simple black design is attractive, with a mottled, fingerprint-proof lid and palm rests. It's a well-constructed chassis, despite a little flex around the DVD drive, and the 2.5kg weight almost matches the Acer Aspire 5552 and Toshiba Satellite Pro S500-15W. The 206 minute battery life is distinctly average though. The smooth and responsive touchpad proves usable, albeit a little too sensitive at times, and there are touch-sensitive controls that open Internet Explorer, toggle Wi-Fi on and off and mute audio. The keyboard is firmly mounted and the sharp travel aids typing, while separate numeric keypad is great for data entry. Unfortunately, the left Ctrl key is indented to make room for the Function key, which is a pain for those using Windows shortcuts. Power is provided by one of Intel's older Pentium processors, backed up by 3072MB of memory. There's enough muscle to run all your office applications and indulge in some light multi-tasking, as with the Dell Adamo 13, but anyone craving more speed should look to the Toshiba Satellite Pro S500-15W. The integrated graphics provide a cheap and basic solution for rendering images. You can comfortably browse your holiday snaps and watch low-res video, but this isn't an ideal machine for editing movies or similarly intensive multimedia tasks. One of the Zoostorm's highlights, however, is the impressively bright 15.6- inch screen. While not as vibrant as some of the other displays, the viewing angles are commendably wide and photos and videos look great. The glossy surface is extremely reflective though. There's plenty of storage space for your files and applications, thanks to the 320GB hard drive. Networking is strong, with 802.11n Wi-Fi providing speedy wireless internet access and Gigabit Ethernet for wired connections. A good selection of ports is also available. An eSATA socket means you can quickly swap files with a high-speed external hard drive and it doubles as an extra USB port, giving you four in total. You also get an ExpressCard slot for expanding your laptop if required.